* naps.....every stinkin' day (just hard to wake up from them). * The cool autumn air outside. I had to wear a hoodie yesterday & that's just fine with me. The fresh air makes me feel so much better. * A Dairy Queen chocolate milkshake for lunch today, cause that's just what sounded good. * not cooking dinner. Frozen dinners or eating out & a family that's okay with it, at least for now. Smells = no good. * A new haircut! Well not new....just cut. * A doggy (Maddy) who is somehow very aware of the change around here & lays on the ground by my side of the bed each night instead of Dylan's. Kinda sweet. * A little girl that is okay with laying down & reading books w/ me in the morning until I feel well & seems to have adjusted the change quickly. * A husband who loves me & still tells me I'm pretty even though I'm pale & constantly have bedhead. Who helps so much w/ Sadie & with chores around the house. Who brings me water & pretzels in bed & so much more. On another note. Sadie's second birthday is in a week. I almost bought her these boots at Target a few days ago. Even knowing that she would want to wear them EVERYWHERE! They didn't have her size....hmm. We're going to Yellowstone tomorrow for a day trip. Hope to have some photos to post later. Love that you can find happiness even when you feel BLAH! Glad that you're hanging in there and know what to expect this time. 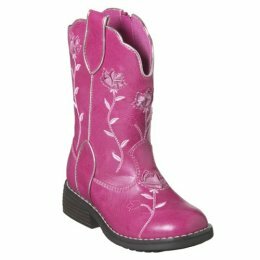 LOVE those pink boots....wish Lauren would want a pair. Who cares if she wears them everywhere they are so dang cute. Feeling sick is a good thing and a bad thing at the same time. Hopefully it won't last long. I heard as well. I hope you feel better. I hated the smell of just about anything. I love your blogs. They are so cute and personal. I love not cooking as well. I can't make bread for the life of me. I am just going to go to Great Harvest.